Esri joins GEO’s effort to broker earth observation data. In progress is the development of an earth observation data service in ArcGIS Online. Sensors, satellites, radar, and other earth observation technologies are used to monitor typhoons, oil spills, deforestation, and more. This data makes it possible to track, learn, and take action when events threaten the environment and human safety. 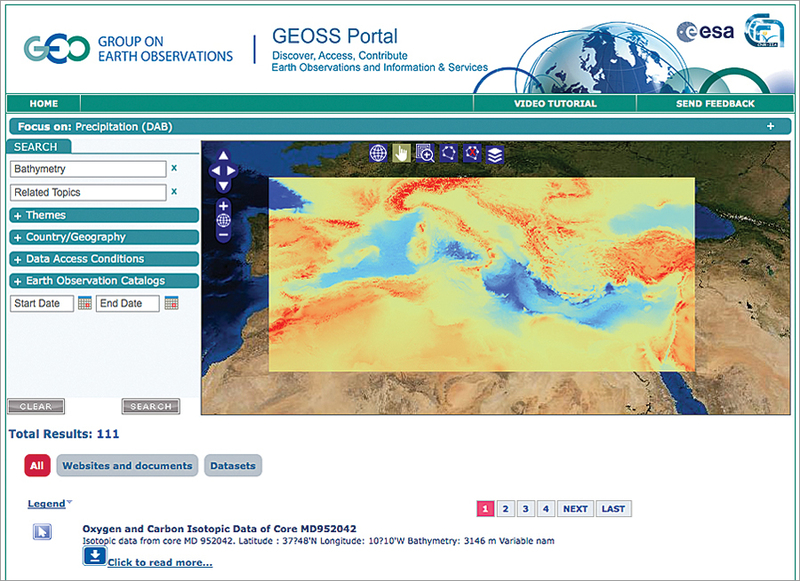 The GEOSS Portal: Here an analyst overlays GEOSS oxygen, carbon, and climate sensor data on Esri's Mediterranean bathymetry to study precipitation. Recognizing a growing and critical need for improved, near-simultaneous observation of the planet, many governments and organizations are collaborating to coordinate their earth observation systems. A voluntary partnership called the Group on Earth Observations (GEO) works together to share earth observation data and science. It includes 90 countries, the European Commission, and 77 intergovernmental, international, and regional organizations. 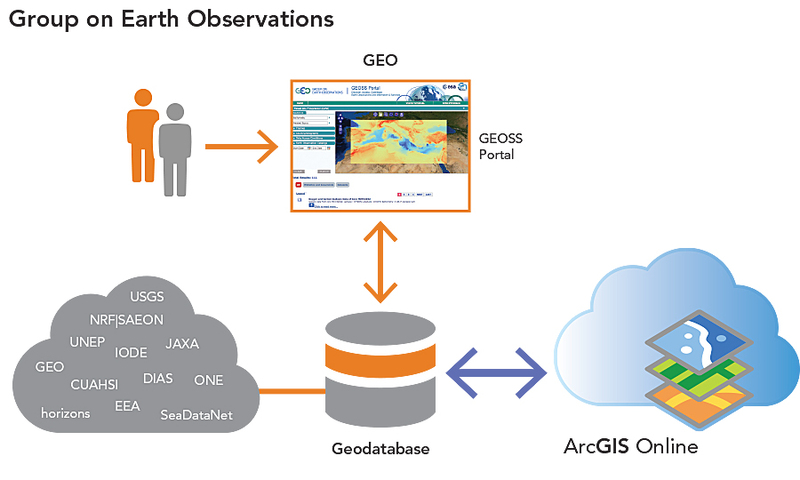 GEO initiated one of the most comprehensive efforts to monitor the entire face of the earth by building a Global Earth Observation System of Systems (GEOSS). The GEOSS program brokers various forms of earth observation data and information via its online platform and a Discovery and Access Broker (DAB). The platform interconnects relevant information systems and infrastructures throughout the world. Esri has long contributed to GEOSS, primarily as a member of the Open Geospatial Consortium, Inc. (OGC). The company is now collaborating with GEOSS Earth to make observation data and services available to the ArcGIS Online community. Many GEOSS contributors are already using Esri technology in their services, such as the European Environment Agency, the United Nations Environment Programme, and the Food and Agriculture Organization of the United Nations. This makes their systems and data inherently interoperable. Esri recently entered into a partnership with GEOSS by way of a memorandum of understanding (MOU) between Esri and the Earth and Space Science Informatics Laboratory of professor Stefano Nativi at the National Research Council of Italy Institute of Atmospheric Pollution Research (CNR-IIA). CNR-IIA and Esri are designing brokering arrangements and direct dataset access technologies, as well as open standards for data interoperability and cataloging. Through this collaboration, ArcGIS Online will become one of the significant infrastructures brokered by the DAB. ArcGIS Online subscribers can discover and access the resources published by GEOSS, use GEOSS data services, and build applications. GEOSS categorizes earth observation data into nine societal areas: sustainable agriculture, biodiversity conservation, climate change and its impacts, natural and human-induced disasters, ecosystem management, energy management, environmental sources of health hazards, water resources, and weather forecasting. Millions of Esri’s GIS customers whose work intersects these societal areas will find GEOSS data directly applicable to their projects. They can use it to establish baselines, monitor change, analyze problems, and design solutions. Organizations can broker their earth observations through the GEOSS Portal, and users can combine data with Esri ArcGIS Online services. CNR-IIA and Esri are building a two-way interoperability technology between the GEOSS DAB framework and ArcGIS Online by way of the ArcGIS Online DAB APIs. Developers will engineer Esri and DAB interfaces and build interoperable web services that interconnect the two systems via several paths. One path starts from an Esri portal and leads the user to discover the main systems of services provided by GEOSS. ArcGIS Online users will access networks brokered by GEOSS DAB, such as the Committee on Earth Observation Satellites (CEOS), the International Council for Science (ICSU) World Data Center PANGAEA, the National Aeronautics and Space Administration (NASA) Global Change Master Directory (GCMD), and the World Meteorological Organization’s Information System (WIS). Another path starts from the GEOSS portal, leading the user to discover Esri services. All public content from ArcGIS Online, such as Esri basemaps and imagery, freely contributed datasets and maps, and tools, will be discoverable through the GEOSS DAB. ArcGIS Online is a resource for authoritative basemaps for the world, as well as topographic and hydrographic imagery. Users can overlay operational data from the GEOSS on these basemaps, along with other ArcGIS Online datasets. This allows specialized communities to fuse knowledge atop common geography. Because earth systems are interconnected, they challenge scientists to reach beyond their specialized domains. Designing technology that bridges scientific disciplines is complicated. Sensor data and sensor measurement systems are highly variable. Data capture, measurement, and quality differ. For instance, sensors and methods used to measure weather are quite different from those used to measure stream flow. Furthermore, scientists manage data differently. Some use manual approaches, and others patch together pieces of software to combine different datasets from different sources. Scientists should not have to spend time learning and modifying technology. These concerns served to formulate Esri and CNR-IIA objectives for platform design. First, develop a specialized search engine for discovering datasets that allow users to obtain raw data for scientific or other work in a remote workstation or server environment. Second, design a flexible architecture that supports continual inclusion of interoperability with the DAB. Third, devise tools to transform data services that can be harmonized, making it possible to integrate sets of measurements. The GEOSS and ArcGIS Online service is unique. One reason is because GEOSS and Esri’s relationship diverges from the traditional scientific relationships between government and public agencies. Since ArcGIS Online is operated by Esri, a private company, it has more flexibility than platforms offered by government-driven or single government initiative programs. Furthermore, ArcGIS Online holds shared geospatial and imagery data of the entire planet rather than for a specific region or area of interest. Data available in ArcGIS Online does not belong to Esri. Rather, the data belongs to hundreds of thousands of organizations that choose to share their basemaps and other kinds of information via the platform. Esri customers are but one of the communities that GEOSS brings together. It connects atmospheric and biodiversity, as well as many other sciences. Bringing GEOSS data into ArcGIS Online will help these communities extend their scope and work together to meet some of earth’s critical challenges. Learn more about GEO and GEOSS at www.earthobservations.org. Use the GEOSS Portal.